News stories about the United States Postal Service (“USPS”) usually include a statement about declining mail volumes. Often prefaced with, “due to diversion to the electronic communication” or “because of the internet”, the reporter or columnist will paint a dreadful picture of the state of the USPS. Hard copy bills and statements are derided as “snail mail”. If posted on a news website, the readers' comments that follow are even more derisive. “I receive and pay all of my bills online.” “Who needs mail delivered to their house?” “The USPS is like buggy-whip factories in the age of the automobile.” Of course, these commenters have an active online presence, so their view is slightly skewed. Mail volumes have declined considerably over the last decade. First-Class Mail – bills, statements, letters and payments – has been significantly impacted by online options. The USPS delivered 35% less First-Class Mail in 2013 than they did in 2004. However, the types of mail that have declined, and the rate of decline tell an interesting story. 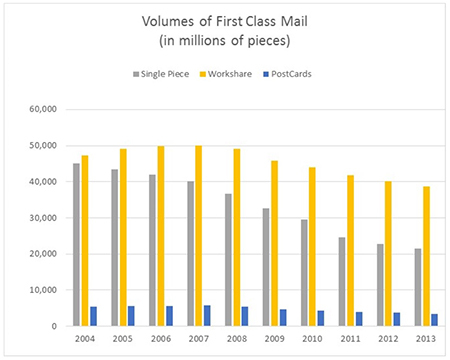 The largest components of First-Class Mail are “Single Piece”, “Workshare” and “Post Cards”. Single Piece mail is composed of mail being deposited with the USPS at the full postage rate, with either a stamp or meter imprint. Much of this mail are payments being sent from consumers to companies and banks. Workshare mail is when companies presort their mail by ZIP Codes, and then receive a discount from the USPS. This is mail sent by companies to their customers. Post Cards can be sent at full rate or at a discounted rate. The biggest drop in mail volumes has been with Single Piece mail. In 2013, the USPS processed 23.6 billion fewer pieces of Single Piece mail than in 2004. This makes up more than 73% of the total decline in First-Class Mail volumes. Much of this decline is caused by more people paying bills either online or through automatic withdrawal from their bank accounts. Workshare mail has also declined significantly, but not as much – only 18% over the last 10 years. Some people have elected to have their bills and statements delivered electronically, just not as many as reporters seem to think. And not as many customers as most companies would prefer. But electronic diversion is only part of the reason for the decline in hard copy mail. The most significant drop in mail volumes occurred during the Great Recession (2009-2011). The USPS saw a loss of over 19 billion pieces of First-Class Mail during this time period, representing 60% of the decline for the entire decade. As the chart below shows, mail volumes continue to fall. However, the rate of decline has slowed considerably. In 2012 and 2013, there was only a 5% and 4% drop in First-Class Mail volumes respectively. The first 2 quarters of 2014 shows the trend continuing, with only a 4% reduction in volume. Significantly, Workshare mail is down only 3%, with the 2nd quarter of 2014 having almost the same number of pieces as 2013. What does this all mean for the USPS and its customers? The drop in First-Class Mail volume is significant, but the rate of decline has slowed considerably. People are paying more bills online, but prefer to receive paper copies of their bills and statements. Mail volumes being delivered to businesses and banks will fall quicker than mail being delivered to households. Physical mail remains a critical link between businesses and their customers. Companies need to remain flexible, offering their customers the ability to receive communication in their preferred format – electronic and paper. The USPS must remain committed to accepting and delivering physical mail in a cost-effective, customer-centric and timely manner.